160 types of cereals from everywhere (England, USA, Germany, Italy…), 25 kinds of milk (including colored ones), and 45 toppings. That’s Cereal Hunters Café, a paradise for cereal lovers and people looking for new flavours to try. Inspired by the famous “Cereal Killers Cafe” located at the hipster Brick Lane in London, this is the first cereal bar in Spain, and it has quickly become a very popular spot. So, if you go there and see that there is a line, don’t despair: there is always a line. Except if you’re an early bird or like to eat cereals when most people won’t, like during lunchtime. The cafe is small, so if you don’t feel like waiting you can take it to go too. My favourites: the mini cinnamon roll cereals and the mini French toast cereals. P.S. 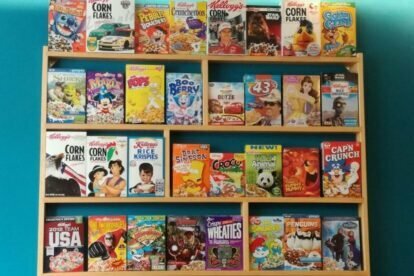 They also have the biggest collection of cereal boxes in Spain: there are some that go back more than 25 years, so don’t forget to check their walls!